Why Does a Piece of Bread Make Hard Cookies Soft? 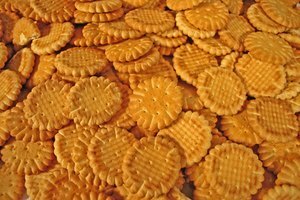 Cookies have far more sugar than the typical yeast breads (wheats, ryes and whites). Sugar is hygroscopic, meaning that it draws water out of the air and holds it in the sugar structure. Bread, on the other hand, is not hygroscopic. It's got an open structure, and all its moisture evaporates into the air. That's why most grocery store bread comes in sealed plastic bags instead of, say, in paper; so it won't get stale and hard. You'll also notice that loaves sold in paper bags, such as French bread, become hard in a day or so. When a hard cookie and a fresh piece of bread get placed together in a plastic bag, two things happen. The hygroscopic cookie starts sucking out moisture from the air. The bread, as always, is evaporating its moisture out into the air of the bag. But now the cookie's sugars are sucking up the bread's moisture for itself, making the cookie nice and soft again while the bread gets hard. Replace the piece of bread every day or so to keep the cookies soft. This trick also works if you have hard sugar; just put a piece of fresh bread into a sealed plastic bag with the sugar. 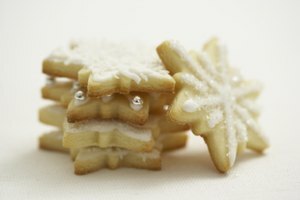 How Should I Store Sugar Cookies After Baking?